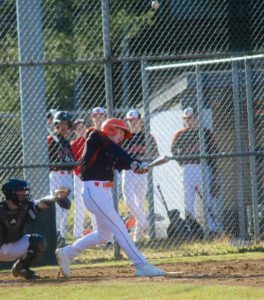 The Bobcat baseball team exploded for five runs in the eighth inning to down the host Brookville Raiders last Wednesday (April 3). Nate Datko had the game winning hit for Clarion. Noah DiTullio led off the extra inning for Clarion, reaching first when his fly ball off Raider pitcher Jace Miner was mishandled by the diving right fielder. With the next batter barely settled in the box, DiTullio moved to third on an errant pick-off attempt, prompting the infield to play up. Nate Datko, facing Caylor in relief of Miner, took advantage of the situation, ripping a single between the encroaching shortstop and third baseman, plating DiTullio with what would prove to be the winning run. “Nate came up big. They had the infield up so we needed something pretty hard up through there and he came through,” commented Jewett. Not content with one run, Clarion tacked on another four, all coming with two outs. 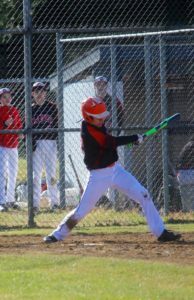 Lake Staub had two RBI for the Bobcats. Datko was joined on the bases by Drew Wrhen and Cole Slaugenhoup who received consecutive free passes. Lake Staub, the seventh Clarion batter of the inning, stroked a single up the middle, scoring Datko and Breckin Rex, running for Drew Wrhen, to give the Bobcats a 3-0 advantage. Cole Wrhen, spelling Slaugenhoup on the base paths, moved to third and Staub took second on the throw in from the outfield. A Chase Kriebel liner to left scored Cole Wrhen and pushed Staub to third. Clarion again loaded the bases after Skyler Pastor was plunked. Staub was forced home with the Bobcats’ final run of the game as DiTullio, batting for the second time in the inning, was issued a full count walk. Kriebel, pitching the final four innings of the game in relief of starter Skylar Rhoades, retired the Brookville side in order during the bottom half to secure the victory. A tightly contested game until the Bobcats broke things open in the eighth, neither side could convert runners into tallies on the board through the first seven innings, though both had several opportunities. Clarion loaded the bases in the top of the first against Brookville starter Chases Palmer, who got out of the inning when his shortstop, Seth Dunkle, corralled a shallow fly to left by Staub for the third out. Scattering three hits over the next three innings, Palmer and the Brookville defense held Clarion scoreless, turning inning ending double plays in the second and third and stranding Bobcat runner Staub ninety feet from home in the fourth. Skylar Rhoades combined with Chase Kriebel on a four-hitter. Meanwhile the Clarion starter, Rhoades, and the Bobcat nine were returning the favor. Miner led off the first for the Raiders with a single to right, but was thrown out trying to steal third after previously swiping second. Dunkle, batting in the two hole, walked and made it to third on a single by Tanner LaBenne. He was left high and dry when Rhoades fanned Caylor to end the frame. Though Rhoades allowed base runners in the second, third, and fourth, none got past second. Palmer ceded the mound to Miner in the fifth, with the new Raider hurler facing the nine batter minimum through the seventh inning. Clarion’s Rhoades was also relieved in the fifth, giving way to Kriebel, whose appearance got tense in short order. 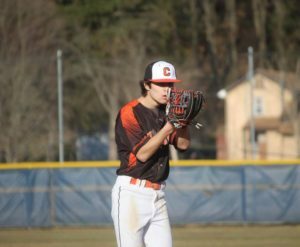 With two outs, Aaron Park singled and moved to third when the Clarion catcher threw the ball into right field after dropping a third strike to number four hitter LaBenne. Kriebel induced the next batter to fly out, quelling the Raider threat. 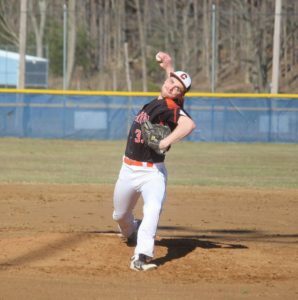 Chase Kriebel struck out eight Raiders in four innings of work. Kriebel cruised through the sixth before having to face another crisis in the seventh, starting when he hit Miner to open the inning. Miner moved to second on a fielder’s choice, while Park was issued a one out intentional walk. Another hit batsmen loaded the based for the Raiders. The Raider menace temporarily stalled when Miner was thrown out trying to steal home. A two out walk to Caylor, however, kept the bases juiced. Kriebel rescued the Bobcats from the jam with a three pitch strike out, setting up the decisive eighth frame. Clarion collected eight hits in the contest, all singles. Datko and Kriebel had two apiece, while Rhoades, Slaugenhoup, Staub, and DiTullio each collected one. Staub had two RBI, with Datko, DiTullio, and Kriebel plating one. Rhoades and Kriebel combined to limit Brookville to four singles. Starter Rhoades walked three and punched out five in his four innings of work, with Kreibel issuing three free passes and fanning eight in the final four. The Bobcats’ game scheduled for last Friday (April 5) against Redbank Valley was postponed due to wet weather.